The area weighted R-value is for finding the R-value of a series of materials together as one. It is most often used when calculating a walls R-value because it considers multiple materials such as drywall, vapor barriers, siding and wall studs, not only the insulation in the walls. 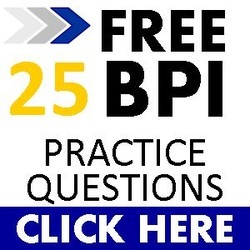 This may be a problem you see on the BPI test, so here is what you need to know. 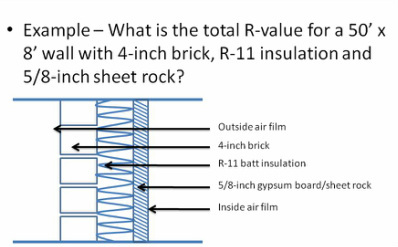 R-value - the measure of a materials thermal resistance in units of ft²·°F·h/Btu. Insulation properties are described in terms of R-values. The higher the R-value, the greater the thermal resistance. U-value - the overall heat transfer coefficient. U-values are a measure of conductance a material. It tell us how much heat conducts through a 1 sq ft area in 1 hr when there is a 1 degree F temperature difference. The smaller the U-value, the better the object is at reducing heat transfer. U is the “total” heat transfer through an object such and takes into account convection and radiation. Window properties are addressed in terms of U-value. U-values are the fraternal twins of R-values, meaning that to find a U-value for a material, simply put 1 over the R-value = U-value. The opposite is true also, to find the R-value of a material given the U-value, take 1 over the U-value = R-value. First create a table of 4 columns of material, R-value per inch, Thickness and Total R-value. Then you can multiply all the R-values by their thickness to get the total R-value for each material. Before going further, try it on your own an see if your number matches mine. 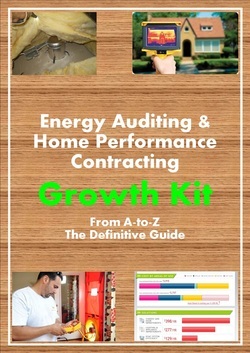 In homes and buildings, walls are not all just insulation. We need to account for the studs and other materials as well. All the materials that make up a wall (air film, siding or masonry, insulation, wall studs, etc). The thickness of all the materials. You will need to account for the wall studs, which are not 100% of the wall area. Multiply the cavity column U-value by 75% or 80% depending if you were given 16 IOC or 24 IOC respectively. Multiply the frame column U-value by 25% or 20% depending if you were given 16 IOC or 24 IOC respectively. Finally, add #8 and #9 U-values up for your total area-weighted U-value. Here is another sample problem you may see on the BPI test to find the R-value of the wall composition. Follow the approach above with your 4 columns. Once you've added the total R-values for all the wall components, remember to multiply the cavity and frame by 75% and 25% respectively.